alaTest has collected and analyzed 533 reviews of Sanyo Xacti FH1. The average rating for this product is 4.1/5, compared to an average rating of 4.1/5 for other Camcorders for all reviews. Reviewers really like the size and portability. The image quality and price are also mentioned favorably. There are some less positive views about the viewfinder, while reviews are divided on the zoom. We analyzed user and expert ratings, product age and more factors. 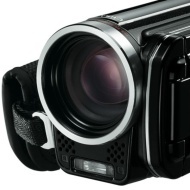 Compared to other Camcorders the Sanyo Xacti FH1 is awarded an overall alaScore™ of 87/100 = Very good quality. The Sanyo Xacti VPC-FH1 is a low-priced digital camcorder ($500 as of 9/25/2009) that delivers good-looking video and stills, with image quality just slightly trailing that of HD camcorders priced nearly three times as much. The Sanyo Xacti VPC-FH1 provides very good performance for its reasonable price. Sanyo's Xacti VPC-FH1 is a high-definition (HD) camcorder that delivers good-looking video and stills. The Sanyo Xacti VPC-FH1 camcorder provides very good performance for its quite reasonable price. Sanyo has made a name for itself producing high quality, low cost camcorders and the Xacti VPC-FH1 is no exception. While it cannot hope to match high-end models from Canon or Sony, it remains a solid performer nonetheless. Sanyo has become all but synonymous with the concept of hybrid digital video/stills cameras and this model offers both high-end video capture and 12Mp of photo detail. However, we weren't fully convinced by its implementation of full HD video. Take stunning full 1080p high definition video at 60fps and amazing 8 megapixels digital photos! The compact Sanyo dual camera Xacti FH1 delivers high performance results with multiple features normally found on much higher priced video and photo cameras. The FH1 packs tons of features which are sure to please the most discerning user; including 600fps slow motion mode, face chasing technology which automatically read and corrects focus and lighting for up to 12 different subjects, and 16x optical zoom for video. Its compact design makes the FH1 extremely portable and easy to use. Videos, still photos and the various settings and menus can be easily accessed with the user's thumb. The FH1's convenient design makes sharing videos and photos via social networking web sites, portable video devices like iPods, TVs and computers, a breeze.